Grandma's collection of 20 old fashioned dessert sauce recipes will help you to make perfect toppings for your homemade puddings. When I was a young boy, I loved it when she served her delicious puddings with a sweet-tasting sauce. She knew better, though, than to let me add my own, since I would end up with more sauce than pudding! I still love sauces and toppings, though sometimes I simply prefer a little heavy cream and a light sprinkle of sugar on my hot puddings. The bottom line: If you like creamy, delicious sauces on your puddings, you will love these! Mom often used this old time dessert sauce recipe when making cake puddings and when she needed a sauce to pour over plum puddings at Christmas time. Mix sugar and flour with a little of the water. Then add the other ingredients and bring to a boil to thicken. I have tried this, and you may want to change it to your tastes. I just make it as I go. Boil all together slowly, removing the scum as fast as it rises; then strain through a sieve. This is very good with dumplings or most puddings. Cream together a cupful of sifted sugar and half a cupful of butter, add a teaspoonful of ground cinnamon and an egg well beaten. Boil a teacupful of milk and turn it, boiling hot, over the mixture slowly, stirring all the time; this will cook the egg smoothly. It may be served cold or hot. One cupful of sugar, half a cupful of butter, one egg beaten light, one lemon (juice and grated rind), half a cupful of boiling water; put in a tin basin [or a double boiler] and thicken over steam. Put half a pint of new milk on the fire and when it boils stir into it one teaspoonful of wheat flour, four ounces of sugar, and the well-beaten yolks of three eggs; remove it from the fire and add the grated rind and the juice of one lemon; stir it well and serve hot in a sauce tureen. This dessert sauce recipe makes an excellent topping to pour over white cake. Mom never added the wine or brandy, and it still tasted delicious. Place over the fire a saucepan; when it begins to be hot, put into it four tablespoonfuls of white sugar and one tablespoonful of water. Stir it continually for three or four minutes, until all the water evaporates; then watch it carefully until it becomes a delicate brown color. Have ready a pint of cold water and cup of sugar mixed with some flavoring; turn it into the saucepan with the browned sugar and let it simmer for ten minutes; then add half a glass of brandy or a glass of wine. Note: The wine or brandy may be omitted if preferred. Into a pint of water stir a paste made of a tablespoonful of cornstarch or flour (rubbed smooth with a little cold water); add a cupful of sugar and a tablespoonful of vinegar. Cook well for three minutes. Take from the fire and add a piece of butter as large as a small egg; when cool, flavor with a tablespoonful of vanilla or lemon extract. So simple yet a popular favorite. Cream or rich milk, simply sweetened with plenty of white sugar and flavored, answers the purpose for some kinds of pudding, and can be made very quickly. One cupful of sugar, two beaten eggs, one pint of milk, flavoring to taste, brandy or wine, if preferred. Heat the milk to boiling; add by degrees the beaten eggs and sugar, put in the flavoring and set within a pan of boiling water; stir until it begins to thicken; then take it off and stir in the brandy or wine gradually; set until wanted, within a pan of boiling water. This is made as the Lemon Cream dessert sauce recipe above, substituting orange for lemon. Creams for puddings, pies, and fritters may be made in the same manner with any other flavoring; if flour is used in making them, it should boil in the milk three or four minutes. This dessert sauce recipe isn't just for plum puddings; it can also be used whenever you need a topping for other kinds of puddings. It can also be made without the wine or brandy; simply flavor it with almond or vanilla and you will have a deliciously creamy topping sauce. Cream together a cupful of sugar and half a cupful of butter; when light and creamy, add the well-beaten yolks of four eggs. Stir into this one wineglass of wine or one of brandy, a pinch of salt, and one large cupful of hot cream or rich milk. Beat this mixture well; place it in a saucepan over the fire, stir it until it cooks sufficiently to thicken like cream. Be sure to not let it boil. Delicious. Melt the brown sugar and butter in a large saucepan, add water, and boil to the desired syrup consistency. Vanilla may be added for flavoring. Here's a basic hard sauce recipe that Grandma used. You can't get more basic than this: 1/2 cup butter, 1 cup sugar (fruit sugar). Cream together and flavor to taste. Keep cold for serving. Taffy from Union, KY writes, "I would like to make a mince pie with hard sauce for dessert, and I need the recipe for hard sauce. Does anyone have a good, old fashioned hard sauce recipe? I'd love to have a copy of it." 2 cups white sugar, 2 cups water, 4 cups fresh or frozen cranberries. Boil sugar and water for 5 minutes, add cranberries, and boil for another 5 minutes, without stirring, until all the cranberry skins open. Remove from heat and allow to cool while it thickens. Makes about 1 quart of sauce that's great for a pudding topping, or for serving with turkey. The best sauce to suit me is made by using a rich cream with plenty of coarse, pulverized sugar, so the spoon will fetch it up from the bottom of the boat, or bowls, at every dip — and I like to dip deep every time; milk does very well but it is well known that it is not so rich as cream; but half and half does excellently. Use any flavoring you please, grated nutmeg is the most common with cream sauce. A tablespoonful of flour rubbed smooth in a little cold milk; pour it into 1 cup of boiling milk, having sugar, 1 cup, rubbed well with butter, 1/2 cup, and as soon as the milk comes to a boil again put in the creamed sugar and butter, and continue to boil 2 or 3 minutes only, and serve, both pudding and sauce, hot. Eat with sugar and cream, if you have it; if not rub 1 butter to 2 sugar, with a little nutmeg, if the pudding is not highly flavored. Almost any pudding is nice to be eaten with plenty of sugar and rich cream. Even milk does pretty well, if rich with sugar and nutmeg; most people like the flavor of nutmeg, at least I have yet to find the first one who does not. Boiling water, 3 cups; sugar, 1/2 cup; butter, half the size of an egg. Mix. Boil a lemon and cut it into small pieces and add to the sauce, putting at least one piece to each dish of pudding in serving. —City Hotel, Winfield, Kansas. Sugar, 2 cups, dissolved in boiling water, 1/2 pint; flour or cornstarch, 2 tablespoonfuls, worked smooth, in cold water, 1 cup, and stirred into the boiling sugar, with nice butter, the size of an egg (hen's egg); then add two or three tablespoonfuls of good vinegar (more or less as a sharp or mild taste is preferred); or brandy, or good wine, in like quantities to suit the taste of self or guests, with cinnamon, nutmeg, or other flavor as you like. One large cup of sugar; nearly 1/2 cup of butter; 1 egg; 1 lemon, all the juice, and half the grated peel; 1 teaspoonful nutmeg; 3 tablespoonfuls boiling water. Remarks. 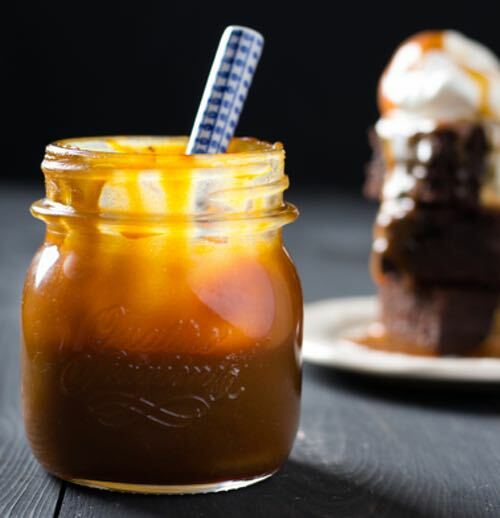 —I see this dessert sauce recipe is modified, slightly, from one of Mrs. Harland's in "Common Sense in the Household," still it will be found a very nice sauce, for any pudding. The principles given by Julia are all correct, but most people use twice as much sugar as butter in making sauces. Cooks can suit themselves. In the folksy manner for which he was famous, the "Old Doctor" goes on to add the following words of wisdom to his remarks — practical words that we would all do well to heed if we desire success. "Experience is necessary to do things well. The author, when he began his work of making "receipt books," had great difficulties to overcome; but twenty years of experience enables him to tell at a glance now what formerly would take a long time, and often several tests to accomplish. Stick to your lifework as I have to mine, and 99 in every 100 will succeed as I have done!" —Dr. Chase. You'll love the old fashioned taste of the sauces made using these traditional dessert sauce recipes. Your favorite puddings will taste extra-special. Bread puddings are especially good when eaten with a sauce and many of these are excellent with them, and with cake puddings too. They also make delicious homemade toppings for your ice cream and pancakes.